This week the daughter is learning all about the letter V in school. For a family project, we could make a vegetable visitor that she can bring to class. Rae wanted a carrot – so I crocheted her one which she liked but though was lonely. I crocheted another one, and then the pair needed kids. 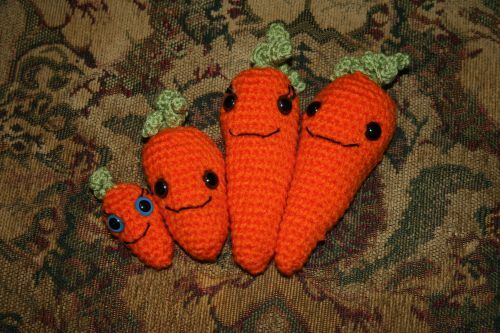 So four crocheted carrots later, the carrot family was born. I gave one carrot sibling blue eyes since my brown eyed child is obsessed with blue eyes at the moment. Each carrot I crocheted a little differently. You know how it is when you try to crochet something twice. No matter how hard you try, they never turn out just like each other. In this case, even though this was a simple project, I didn’t work from a pattern or write down what I did for the first carrot since I thought this would be a one time project. If I had known that I would make three more, then I would have at least jotted some notes down. She really likes them. I had to do eyelashes for the two girls – my first ever attempt at those. They didn’t turn out half bad. Whipping up these carrots makes me want to do more food crochet. I love starting and finishing a project the same day. It’s such a sense of accomplishment. Also to make someone who just absolutely loves it is so rewarding.